Here’s a summary of my stories in 2011. The links below go to subpages with reviews. These are also eligible for the Hugo, Nebula, and Aurora awards. I’ve placed “We Who Steal Faces” in the SFWA discussion forums, or email me if you’d like to see it for your consideration. Thank you. WHEN THE HERO COMES HOME, which contains my story “Brine Magic,” is now available on Amazon, in print and Kindle versions, and available in epub on the Dragon Moon Press website. Also check out the Goodreads page. The official launch will be at GenCon in August, and the book will also be on sale at Dragon*Con. Many thanks to the editors Gabrielle Harbowy and Ed Greenwood for their hard work in bringing this out much sooner than expected! 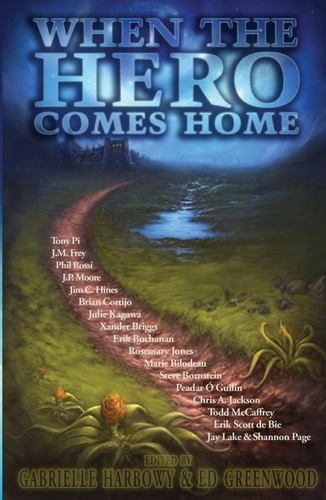 WHEN THE HERO COMES HOME, an anthology of fantasy and science fiction tales—co-edited by Bestselling author Ed Greenwood and Gabrielle Harbowy, Editor and Associate Publisher, Dragon Moon Press—will be released in August of 2011 by Dragon Moon Press. When the epic battle, the mission, the quest are over, can the hero go home again? Is she too changed to resume where she left off… Is the life he left behind is no longer waiting for him? In WHEN THE HERO COMES HOME, these questions are addressed in nineteen powerful stories by some of today’s top and up-and-coming fantasy and science fiction writers. “We’ve been very pleased with the stories we’ve received. Strong storytelling featuring great characters, from both new voices and established writers. They’ve given us wildly different approaches to our theme—which is just what the title of the book says it is,” says Greenwood. “It’s a thrill to be able to work with Ed and with so many other talented writers, and to have an opportunity to showcase some of Dragon Moon Press’s up and coming authors. Each story gives the theme its own fresh, fascinating spin. Whether you’re into swords and sorcery, science fiction, or urban fantasy, there are stories here that will grab you,” says Harbowy. The anthology features new fiction by Jay Lake, Todd McCaffrey, Julie Kagawa, and an all-new Jig the Goblin story by Jim C. Hines. I can’t wait to see the full TOC…it’ll be a surprise for me too!